Shop the T3 Singepass Wave! World renowned for revolutionising the world of hair styling, T3 believes in the #Powerwithin, creating styling tools which perform as beautifully as they look. The award-winning collection of pioneering hair styling tools began with the innovative Tourmaline-infused T3 Hair Dryer that delivers faster, healthier and shinier results. Created when T3’s Founder Kent Yu noted the loud, ugly and inefficient dryer his girlfriend was using to style her hair, the T3 Dryer kick started the invention of T3’s nurturing, sleek and efficient hair tool collections. Empowering women to look and feel their best and providing stylists with the tools they need to excel in their art, the love of T3 begins with the T3 dryers. Infused with T3 Tourmaline SoftAire™ technology, T3 dryers pioneer the ground-breaking technology that the brand is known and loved for. Promoting healthy hair, as well as sensational style, T3 dryers work to reduce drying time, ensuring body strain is alleviated and the hair cuticle is protected. Fan favourites include the T3 Compact Dryers. Despite being miniature dryers with small frames and ultra-light bodies, the highly convenient dryers promise to deliver a fast and hair-enhancing drying experience. Ultra-convenient for travel and storing in small spaces, the dryers emit ion-enriched air and can rapidly dry large sections of hair. The T3 Compact Dryers also feature a scratch-resistant surface, full-sized handle, two speed and heat settings, dual voltage and come complete with a storage tote. T3 caters for all hair types, with the T3 Featherweight Luxe 2i Dryer being created especially for those with thick and difficult hair. Winner of two Allure Best of Beauty Awards, the Featherweight Luxe 2i comes complete with a Tourmaline Ceramic Brush for maximum benefits. The Ion Generator-enhanced dryer promises to banish frizz, boost shine and dry hair gently in no time at all. With 3 heat settings and 2 speed settings, the ion-enriched airflow from the dryer offers superior results every time. As the first ever electrical brand to be sold into the multi-billion dollar powerhouse that is Sephora, this revolutionary brand is known and loved by haircare experts globally, including by Hollywood superstar Blake Lively’s personal stylist. Get yours now on Gorgeous Shop. Beautiful outside and powerful inside, there’s a reason T3 was the first ever electrical brand to be sold into the multi-billion dollar powerhouse that is Sephora. Believing in empowering women to look and feel their best, and giving stylists the tools they need to excel in their art, T3 was created with the mission in mind to deliver faster, healthier and shiner results. T3’s award-winning straighteners are musts to add to your styling collection. With added health benefits, all of T3’s intelligent tools are designed to nurture, reducing styling times, sealing in moisture and elevating styling prowess. 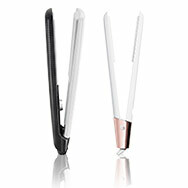 A firm fan favourite, the T3 Singlepass X, is the perfect straightening iron for those with long, thick or coarse hair. Featuring larger 1.5 inch T3 Tourmaline and ceramic plates for 50% more power than the 1 inch iron, the powerful straightening iron also features an internal microchip for even temperature. Sealing the hair cuticle for a smooth and shiny finish, the innovative hair tool is a must-have for those who seek the best for their hair. With T3 becoming the official tool backstage at the Oscars in 2011, two years after T3 launched the SinglePass Iron with innovative digital SinglePass™ Heating Technology, T3 has the Hollywood seal of approval. 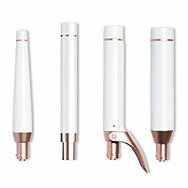 With the T3 Singlepass and T3 Singlepass Luxe also able to add volume, waves and curls as well as straighten hair, the versatile T3 styling tools are known and loved by haircare experts globally, including by Hollywood superstar Blake Lively’s personal stylist to create Blake’s signature boho waves. So whether you go for the T3 Singlepass, T3 Singlepass Luxe or T3 Singlepass X, you’re can rest assured your hair will be both cared for and beautifully styled with T3 at Gorgeous Shop. 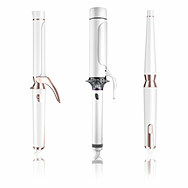 T3’s collection of curling tools is designed with craftsmanship at its core. Perfectly aligning style with substance, the precision tools are loved by haircare experts globally, including by Hollywood superstar Blake Lively’s personal stylist, who uses them to deliver Blake’s signature voluminous waves and curls. Promoting healthy hair, as well as sensational style, T3 tools are intelligent designed to expressly nurture hair, reducing styling time and ensuring a gorgeous finish. Fan favourites include the T3 Whirl Trio, winner of the 2015 and 2016 Allure Best of Beauty Award. The ultimate tool for creating waves and curls, the Whirl Trio features Digital T3 SinglePass technology and measures and adjusts temperature for consistent healthy results. The hair tool features three easily interchangeable T3 Tourmaline and ceramic barrels which work to seal the cuticle for a smooth and glossy finish. For those who love rollers to get their desired volume and style, T3 Volumizing Hot Rollers Luxe is the perfect solution. Powered by advanced T3 HeatCore Techology, the roller set enables dual temperature settings for all hair types, ensuring the ideal styling temperature for your hair type and desired look. Boosting volume and adding body and shine to locks, the rollers also come complete with a storage case for travel. So whether you’re seeking wonderful waves, voluminous tresses or sleek and defined curls, you’ll find your styling solution with T3 on Gorgeous Shop. For those seeking the ultimate tousled locks, the T3 Whirl Convertible styling wand featured Digital SinglePass™ technology to ensure an even temperature is maintained while styling is the perfect option. There are five adjustable heat settings, between 260°F and 410°F, and the auto world voltage and one hour auto off setting ensures user safety. Resulting in frizz-free and fast results, gorgeously textured and tousled locks are created using the tapered tourmaline and ceramic barrel, which also cares for the hair by sealing the hair cuticle for ultimate staying power. The interchangeable barrel design (with additional barrels sold separately) means the styling possibilities are endless! As the first ever electrical brand to be sold into the multi-billion dollar powerhouse that is Sephora, this revolutionary brand is known and loved by haircare experts globally, including by Hollywood superstar Blake Lively’s personal stylist to create Blake’s signature boho waves. Each hair styling tool, from the Featherweight Compact Dryers to the Volumizing Hot Rollers and Twirl and Whirl Convertibles offers a specific style for every occasion. T3 believes in empowering women to look and feel their best, and giving stylings the tools they need to excel in their art. Powered by innovative technologies, including SoftAire and ProAire for drying and Tourmaline + Ceramic blends for exceptional performance and superior results, T3 tools inspire the industry with their intelligent design. Fan favourites include the T3 Bodywaver. Winner of the Total Beauty Award, the innovative styling iron is the perfect too for creating bouncy, voluminous and luscious waves. The T3 Bodywaver is also powered by radial technology, working to deliver even and consistent heat throughout the hollow barrel to ensure hair is not exposed to the risk of heat damage. With added health benefits, all of T3’s intelligent tools are designed to nurture, reducing both drying and styling times, sealing in moisture and elevating styling prowess. For example, the T3 Whirl Trio features Digital T3 SinglePass technology, measuring and adjusting temperature for consistently healthy results. Pairing enlightening technological concepts and smart solutions with beautiful style, when you purchase a T3 styling tool on Gorgeous Shop, you can rest assured your hair will be both sensationally styled and carefully cared for. The award-winning collection of pioneering hair styling tools began with the innovative Tourmaline-infused T3 Hair Dryer that delivers faster, healthier and shinier results. Created when T3’s Founder Kent Yu noted the loud, ugly and inefficient dryer his girlfriend was using to style her hair, the T3 Dryer kick started the invention of T3’s nurturing, sleek and efficient hair tool collections. Undone waves, defined curls, tousled locks - discover which barrel size you need to create your hair whirl! Our Styling Saviours to help protect your hair, create silky shine & make your finish last! Your go-to guide on how to use Hot Rollers by T3 to create beautiful Natural Waves! T3 tools come with a 2 year warranty.